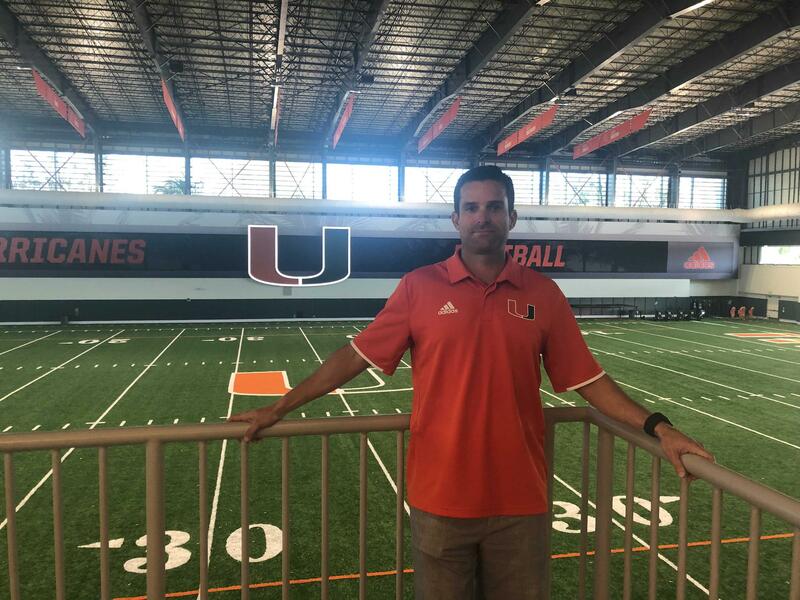 Hanging out with new Head Coach Manny Diaz at the UM football facility. 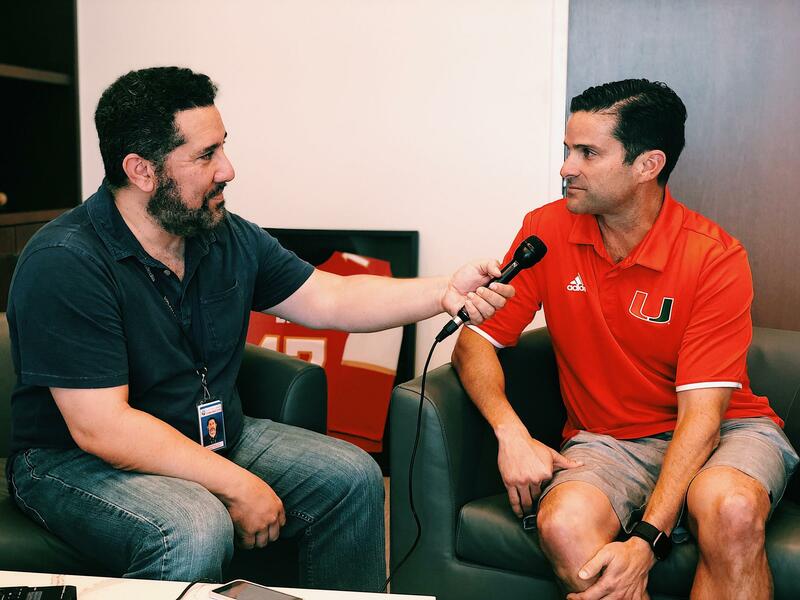 Manny Diaz is a Miamian. He understands the history and lore of "The U." It was Diaz who helped create the "Turnover Chain" that became a national conversation. He also helped make the Canes defense one of the scariest in the country. The university called Diaz shortly after Richt's retirement and offered him the job. The Sundial team sat down with the new University of Miami football coach at his office to discuss the pressure of leading his home team. We started by asking him about his favorite Canes memory as a fan. DIAZ: When I was a kid, going to the big games in the Orange Bowl on Saturdays, whether it was '86 [against] Oklahoma. That might be one of the game that really put Miami on the map nationally. Miami had won a national championship in '83 but  that's really when they were sort of taking things over. And Miami had always had big games, Florida State games in the Orange Bowl, but this was the first time a major opponent came in and the city just brought it and it was just a dominating performance from start to finish. So just all those sort of magical nights or magical Saturday afternoons in the Orange Bowl when I was growing up. And really it was very important because it was at a difficult time in the 80s, Miami was going through a lot of different types of growing pains and the one thing that the city could all come together on was the Miami Hurricanes. It represented us and the diversity of the city, and the uniqueness of our culture down here I think was all really represented and watching those guys run around and play. WLRN: This is a team with a lot of history; a lot of championships. You're reminded of that every time you walk around, the banners are there. There is the pressure to live up to a standard, to live up to that history. You're now the new coach. What's the pressure you're feeling? You don't put pressure on yourself any more than what you would do to do the best job you can do. Everyone understands the expectation here but why would you want to work at a school that doesn't have the expectation of winning a championship? Why would you want to recruit a player that doesn't want to come to a university where winning national championships is the standard? One thing that I believe in, whether it's coaching or parenting or running an organization or a company, is that people will rise to the standards that you set. And so, to me, it's a great thing here at the University of Miami where we can hold our young men to extraordinarily high standards because they understand what the expectation here is. We want to compete for championships here in Miami. What is the strategy in recruiting? How do you go out there, and you're talking to the top talent, and you've got to convince some young man, come play for us? A couple of main things pop up. Number one, it's about relationships because ultimately we're in the relationship business and recruiting is about establishing a relationship with the young man and his family, to let them know that you don't just choose a university, you're choosing the people around the university who say they look after the student-athlete with their best interest in mind and that can maximize their potential. That's really what this is all about. The second thing though, and this is where it's really exciting here at the University of Miami, is that the young man wants to make sure that we are a big-time program not just because we can point to our five national championships. So the brand new Carol Soffer indoor practice facility, brand new dorms on campus that are coming next year - that is a game changer for the University of Miami; what they've done to the stadium. All these little negatives that people used to recruit against us, they're all slowly going away. So you can tell a young man you don't have to go to who knows where to play big-time college ball, you can do it at home. Those things maybe didn't matter as much in the 80s and 90s, they matter a lot today. I'm fully aware that me and my staff are the beneficiaries of things that previous head coaches did not have, and it is hard to compete against the current bluebloods of college football without some of the same things that they have. Coach Manny Diaz, "Why would you want to play for a school that isn't competing for championships?" What about the rigors of academics and football? What do you tell parents when you're sitting down and talking to them and their kids about the education? How do you ease their concerns? Well, you mentioned the keyword which is education. A lot of colleges will sell that you'll get a degree. And you can get a degree, but getting a degree and getting an education are two different things. And one thing that stands out with the University of Miami compared to people that we recruit against is that we are a private school. We have a small student body. A lot of our recruits don't know that we're a private school at first glance. And when they start looking at our average class size and that you're going to have a personal relationship with your professors, the people that teach you, instead of having to call a teaching aid or a graduate assistant if you have to ask questions, those are the things that really make the University of Miami stand out academically. You can have a piece of paper that says you got a degree but you can still not have the education that really takes to find value in your life after football. The one thing we guarantee all these young men, at some point in your life someone's going to tap you on the shoulder and say you can't play this game of football anymore. And the 'what next' is a lot longer part of your life than the 'what now.' And if they're not prepared for that, if we're not preparing them for that, then we're really doing them a disservice. Of course, the other thing when you talk about football is the issue with head injuries. The NFL is putting all this effort into trying to reduce that. What has college football done to try to reduce it? It has to be first and foremost in my mind because I'm going into these living rooms and, again, the most valuable resource to the family is their child and they're putting me in charge of their child. So if I don't have their wellbeing and everything we do, I'm not worthy of holding the position I hold. Certainly, we've changed rules in the way the game is played. That's had a profound impact. The biggest thing for us is that I've been, this will be my sixth year now, we've changed the way that we tackle. We took the head out of the tackle and that's made a profound impact in the safety of the players we've coached and the amount of head injuries that we've had through tackling. And you can play this game in a safe way. There's no doubt that there was a culture around football that in the past - I still can't get my dad to drink water if we're playing golf because he thinks that drinking water means that you're taking the easy way out. But those are some of the more, I hate to say it, but barbaric coaching methods of yesteryear and those things are gone. They had to go and there's too much information out there and we want to sell that we can make this game as simply safe as possible for the young men to play it. Manny Diaz inside the new Carol Soffer indoor practice facility. Yeah. And that's just my family ... But no one wants it more than I do. And that's the thing. I mean, no one wants it more than anybody on the staff and no one wants it more than the players in our locker room. So it's impossible really for anyone to hold or to put more pressure, to hold us to a higher standard than we hold to ourselves. I think if we understand that and we understand how we're defined and we know how these things are built and how cultural programs are built and we want something that is sustainable for the long term, I think we feel really good about we're at.